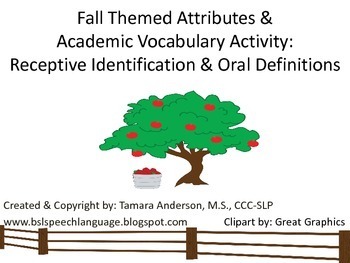 This learning activity provides students practice with identifying Tier I fall themed and Tier III academic vocabulary when provided attributes from their speech-language pathologist, special education teacher, or regular education teacher. It also gives them an opportunity to practice verbally defining the provided vocabulary. 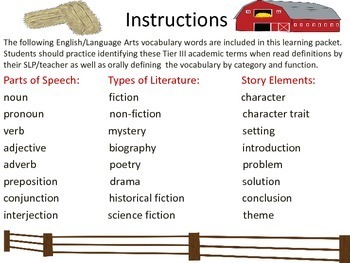 This packet contains 18 fall themed vocabulary words and 24 English/Language Arts vocabulary from parts of speech, types of literature, and story elements categories. 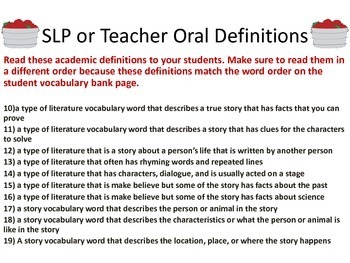 The definitions are provided in this packet to make it quick and easy for the SLP and teacher to read to the students. 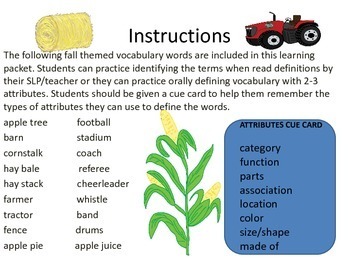 Then, students may use the fall themed and academic vocabulary word bank to help them recall and identify target terms. The word bank also contains an attributes cue card on the page that will help guide students' oral definitions. Enjoy the fall season and providing your students direct vocabulary instruction as well as guided practice with this activity. I appreciate your feedback.